The first day of summer, my biggest was just out of Kindergarten and my littlest had just turned 3. A warm breeze was drifting by, the sun was on our faces and for the first time in a while I was at peace. We needed this day, many days for the past two years were so very painful. My marriage was in deep trouble and we were fighting desperately to save it. This day felt to me like a new beginning. We were finally coming out of the darkness and I saw hope. We spent most days that summer outside, taking walks to Starbucks, going to the park, having coffee on the patio with sweet friends. Everywhere we went, the same butterfly accompanied us. Whenever I saw my new friend I would hear a still small voice whisper “be strong.” She became a great comfort to me, as if God had sent an angel to remind me he was always with me. My new friend even paused long enough to let the boys and I hold her. Don’t copy the behavior and customs of this world, but let God transform you into a new person by changing the way you think. Rom 12:2. The word “transform” or “change” comes from the Greek word meaning “metamorphosis.” It’s the same Greek word used when a caterpillar changes into a butterfly. When we “let God transform us into a new person,” we are allowing God to literally change every part of ourselves from the inside out. We are asking God to give us wings and let us fly. God is the creator of all things and allows us to see the transformation he designed in nature. To give a clearer picture of the stages of transformation in us, let’s first look at the stages of a caterpillar becoming a butterfly. The Egg. Many eggs are laid on a large leaf. Some eggs will survive and some will not. The Caterpillar. The egg hatches and the baby caterpillar emerges. She has an insatiable appetite. Her primary purpose at this stage of development is to eat everything in sight. As she grows and grows, she sheds her old skin several times and grows new skin. The Cocoon. Once the caterpillar stops eating she finds herself a cozy safe spot on a tree, turns upside down and forms the cocoon around her. The color of the cocoon is brown or green, usually the color of the things around it to keep it protected. Super cool, little known fact: She then begins to digest herself. If you open the cocoon up at just the right time, a soupy goo would seep out – (please don’t try this at home, you would kill the caterpillar and her chances of becoming a butterfly.) Essential parts of the caterpillar remain and the parts that will eventually become the butterfly will develop from the soupy goo. The Butterfly. The butterfly will emerge from the cocoon tired and wet. The butterfly rests and begins to pump blood into her wings. Once she has regained her strength, she begins to practice her flying. She can then find a mate and lay her eggs. Thus, starting the whole process again for the next generation. As I look back from the day I asked Jesus to be my savior, I can see these same stages in my own development from a baby Christian, to the woman God designed me to be from the beginning. Egg. Before I lived in step with God, I was blinded by my surroundings. I lived in my worldly bubble, solely for myself, clueless to everyone else around me. In hindsight it was such a hard way to live. I was often frustrated, irritated, bent out of shape, making poor choices and just getting through the day. Caterpillar. I was born into God’s family and I had an insatiable appetite for God. I studied his word every chance I had. I learned everything I could about my glorious savior, and I immersed myself in my church family. I grew and grew and grew, shedding my old skin as I went along. Cocoon. Once I prayed this big bold prayer for transformation, I really had no idea exactly what that would look like. I’ll tell you what it looks like – it looks like soupy goo, turned upside down, shut in a small dark closed off space with no windows, clamped onto a tree, stuck in one place. All the while God is melting down the things I don’t need any more and building anew the things that I do. To put it in terms of real life: being called out of comfortable places at work, facing fears of rejection, owning my lack of self-respect, making lots of mistakes, and battling feelings of inadequacy. In short, it’s been a very hard year. Welcome to the cocoon. Butterfly. I don’t know if the encapsulated caterpillar knows what’s happening, or if she knows what she will eventually be. 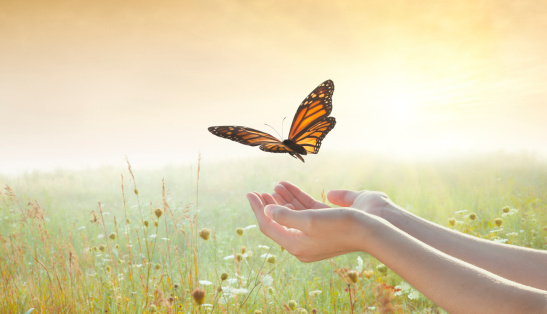 While I haven’t fully completed the transformation and emerged a butterfly, God is gracious to give me a glimpse of who he is creating me to be. It’s not until the caterpillar becomes a butterfly that she can find a mate, therefore it’s not until I am transformed that I can be the wife God created me to be. It’s not until she has come out of her cocoon, rests and tries out her wings that she can fly. God has given me a desire to fly, and I believe the process will take patience, trial and error, and faith. I am still accompanied by yellow monarchs from time to time. When sightings become more frequent, I know a season of change is coming my way. I’ve often wondered if my butterfly’s presence was really a sign from God, or if I was just making it up in my fanciful head. What I do know, with 100% certainty, is that God uses his beautiful creations to directly, profoundly and intimately speak hope into us. Absolutely lovely! And to me, you are one of the most beautiful butterflies I know! Keep writing! You helping to encourage and change lives. This is so encouraging and inspiring. God bless!! Amazing! I love your story!